Galileo was born in the same year as Shakespeare and on the day of Michelangelo’s death. Appointed to the Chair of Mathematics at the University of Pisa when he was 25 his studies of motion there and later at Padua provided the foundation of the study of dynamics. His contributions to the the development of gravitational theory and motion were to terminally undermine the tenets of Aristotelian motion and physics. In 1604 a bright new star appeared in the constellation Serpentarius. Galileo’s observations detected no parallax, suggesting it was a star and not some atmospheric phenomenon. This result confirmed Brahe’s findings from the nova of 1572 that stars could change and again challenged the Aristotelian orthodoxy. When Galileo heard about a new optical device, the telescope, in 1609 he quickly built his own version. 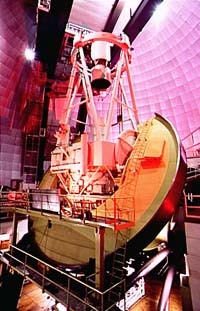 He then used it and more refined telescopes to systematically observe the night sky. 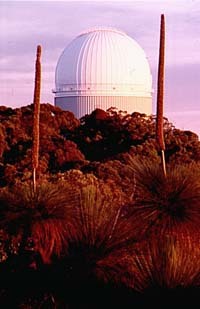 Details on Galileo’s use of the telescope can be found in the HSC Astrophysics section. His findings, published in 1610 in Sidereus nuncius (The starry messenger) had important implications. According to Aristotelian principles the Moon was above the sub-lunary sphere and in the heavens, hence should be perfect. Galileo found the “surface of the moon to be not smooth, even and perfectly spherical,…,but on the contrary, to be uneven, rough, and crowded with depressions and bulges. And it is like the face of the earth itself, which is marked here and there with chains of mountains and depths of valleys.” He calculated the heights of the mountains by measuring the lengths of their shadows and applying geometry. He also detected earthshine on the lunar surface, that is the Moon was lit up by reflected light from the Earth just like we receive reflected light from the Moon. Galileo’s drawing of the Pleiades shows many more stars than visible to the unaided eye. Even through a telescope the stars still appeared as points of light. Galileo suggested that this was due to their immense distance from Earth. This then eased the problem posed by the failure of astronomers to detect stellar parallax that was a consequence of Copernicus’ model. On turning his telescope to the band of the Milky Way Galileo saw it resolved into thousands of hitherto unseen stars. This posed the question as to why there were invisible objects in the night sky? The moons of Jupiter as drawn by Galileo over successive nights. Observations of the planet Jupiter over successive night revealed four star-like objects in a line with it. The objects moved from night to night, sometimes disappearing behind or in front of the planet. Galileo correctly inferred that these objects were moons of Jupiter and orbited it just as our Moon orbits Earth. Today these four moons are known as the Galilean satellites; Io, Europa, Ganymede and Callisto. For the first time, objects had been observed orbiting another planet, thus weakening the hold of the Ptolemaic model. The Earth was clearly seen to not be at the centre of all motions. Two subsequent observations also undermined the Arisotelian-Ptolemaic Universe. Galileo found that Venus exhibits phases, just like the Moon. This of course could be accounted for in a Copernican system but not in a Ptolemaic one. He published a letter in 1613 announcing his discovery of sunspots in which he also proclaimed his belief in the Copernican model. Monitoring sunspots showed that the Sun rotated once every 27 days and that the spots themselves changed. The concept of a perfect, unchanging Sun thus also became untenable. In presenting his views in his Dialogue concerning the two chief systems of the world, the Ptolemaic and the Copernican in 1632 Galileo reignited his earlier conflict with the authorities of the Catholic Church. Eventually forced into publicly recanting his belief in the Copernican system and being placed under comfortable house arrest his Dialogue, along with the works of Copernicus and Kepler was placed on the Index of Forbidden Books. Galileo spent the last years of his life working once again on trying to understand motion. The resultant final book Dialogues concerning two new sciences had to be smuggled out of Italy before being published in Holland in 1638. It primarily dealt with describing motion, kinematics, but also revealed that acceleration resulted from the application of a force and that he was aware of the concept of inertia. He rejected Aristotle’s ideas of forced and natural motions after studying falling or rolling objects and projectiles and realised that gravity was some type of force acting in terrestrial situations though he does not seem to have extended this to heavenly motions. Whilst Galileo did not propose his own model of the Universe, his observational, experimental and theoretical work provided the conclusive evidence need to overthrow the Aristotelian-Ptolemaic system. His work on forces was to help Newton develop his dynamics. Galileo died in 1642, the year that Newton was born. Isaac Newton is the pivotal figure in the scientific revolution of the 16th and 17th centuries. He discovered the composition of white light, and laid the foundations of modern optics. In mathematics he invented infinitesimal calculus and the binomial theorem. His work on the laws of motion and of universal gravitation became the basis of modern physics. Whilst today remembered for his immense contributions to science the bulk of his writings were actually in the fields of theology and alchemy though as his views on both of these was contrary to the establishment he kept many of them secret. During 1665-6 Newton returned to his home at Woolsthorpe from Cambridge when the University closed due to the Great Plague. This period allowed him time to develop his ideas on optics and light, planetary motions and the concept of gravitation. By 1670 he was Lucasian Chair of Mathematics at Cambridge, had developed his corpuscular theory of light and built the first successful reflecting telescope, thus avoiding the chromatic aberration problems inherent in the lenses of refracting telescopes. For this he was elected a Fellow of the Royal Society. He withheld publication of chief work on light, Optiks, until 1704, the year after his adversary Robert Hooke died. Newton’s scientific legacy rests on his other work, the Philosophiae Naturalis Principia Mathematica (Mathematical Principles of Natural Philosophy), generally known as Principia published due to Edmond Halley’s urging and funding, in 1687. His detailed exposition of the concepts of force and inertia is summarised eloquently in his three axioms or Laws of Motion (from the translation in On the Shoulders of Giants, ed. by Stephen Hawking, Running Press, 2002). Law I: Every body preserves in its state of rest, or of uniform motion in a right line, unless it is compelled to change that state by forces impressed thereon. This is more commonly stated as: An object remains at rest or in a state of uniform motion unless acted on by an unbalanced force. This is now commonly referred to as F = ma and emphasises the vector nature of force. The true genius of his work is that he then went on and applied them not just to motion on Earth but realised that they applied equally to the motions of other bodies such as planets in space. He applied his mathematical techniques to investigate the nature of the force between the Earth and the Moon, and the Earth and the Sun. His solution revealed the force to obey an inverse-square relationship and result in elliptical orbits as calculated by Kepler. where F is the force between any two objects of masses m1 and m2 respectively and separated by a distance r.
where G is a constant known as the Universal Gravitational Constant. The force of attraction between any two bodies in the Universe is proportional to the product of their masses and inversely proportional to the square of their distance apart. Having shown that gravitationally all the mass of an object can be assumed to be at its centre of mass, the gravitational force therefore acts along a line joining the two bodies. It is always an attractive force. The gravitational mass of an object was shown to be identical to its inertial mass (that which hinders its change in motion). For a two-body system such as the Sun-Earth an equilibrium exists such that the gravitational force = centripetal force. Using this relationship Newton was able to derive Kepler’s Third Law. where mS and mE are the masses of the Sun and Earth and ω is the angular velocity of the Earth around the Sun. This value of k is a constant for all bodies orbiting the Sun as it only depends upon the mass of the Sun and the constant, G.
Newton’s contributions profoundly influenced subsequent generations. His view of the Universe was a mechanistic one that ran like clockwork and had a designer. The success of his law of gravitation was confirmed in 1758 when a bright comet returned as predicted earlier by Edmond Halley. He realised that it would be the same comet that had previously been seen in 1531, 1608 and 1682. This comet was subsequently named in his honour and we now know it was the same comet shown on the Bayeaux Tapestry commerating the Norman invasion of England in 1066. Gravity is a force of nature that you experience every day. It’s produced by all matter in the universe and attracts all pieces of matter, regardless of type. The Earth produces gravity and so do the sun, other planets, your car, your house, and your body. Sir Isaac Newton invented gravity in 1687 when he failed to pay attention while sitting under a tree and got bonked on the noggin by an apple. Before that, gravity didn’t exist, and everyone just floated around. Okay, Isaac Newton didn’t invent gravity. But the famous mathematician was the first to study gravity seriously, and he came up with the theory of how gravity works. Newton’s law of universal gravitation states that every object in the universe attracts every other object in the universe. The amount (force) of the attraction depends on the mass of the object. If you’re sitting in front of your television, you may be surprised to know that the television set is attracting you. However, because the mass of the TV is so small compared to the mass of the Earth, you don’t notice the physical “pull” toward the television set. On Earth, gravity pulls objects downward toward the center of the Earth. The force of gravity acting on an object is equal to the weight of the object. Of course, other planets have lesser or greater masses than the Earth, so the weight of objects on those planets, and thus the amount of gravitational pull, will be different. For an object to really lose weight, it must be far away from the Earth (or any other large body). When an object is far enough away from these bodies that it experiences practically no gravitational pull from them, it is said to experience weightlessness — just like the astronauts you see on TV. The more massive the object, the greater the force. The greater the speed of the object, the greater the force. The greater the distance from the center of rotation, the greater the force. Centrifugal force doesn’t really exist, so many scientists refer to it as a false force. It’s not a force at all, but rather a product of Newton’s (remember him?) laws of motion. This characterization seems wrong because when your car goes off the road and crashes or when your bicycle skids out from under you when cornering a slippery curve, you feel like this force had something to do with it. Because it feels real, it’s often useful to treat it as if it’s a real force. If you’re riding a merry-go-round on the playground, you have to exert a constant force to keep from flying off. This force isn’t due to something actually pushing you in that direction, but by your body’s inertia trying to keep you moving in a straight line. Because one of Newton’s laws states that accelerating objects tend to want to travel in one direction, as the merry-go-round turns, your accelerating body wants to keep traveling in one direction, so you feel you’re being “pushed” outward. This entry was posted in Science on November 29, 2012 by Barbara.